On April 25, 2018, His Excellency Emmanuel Macron, President of France, hosted a town hall with GW students during his visit to Washington. This was the first state visit of the Trump administration. In honor of President Macron’s visit to Washington – and to the GWU campus – the University designated April 23-April 27 as “French Week” during which the Law Library and other departments across campus staged French-themed events, including exhibitions and lectures. The Law Library mounted an exhibit of some of the treasures of its French Collection, with materials dating from the twelfth through nineteenth centuries. The exhibit provides a marvelous opportunity to examine at leisure eleven of the most important pieces in the French Collection, including early manuscripts (customary law, a deed, a charter, and a royal official’s will), an incunable printing of the Anjou and Maine customary law, two important “post-incunabula,” a first edition of Napoleon’s Code Civil, and a historically significant French Revolutionary pamphlet (printed July 13, 1789). 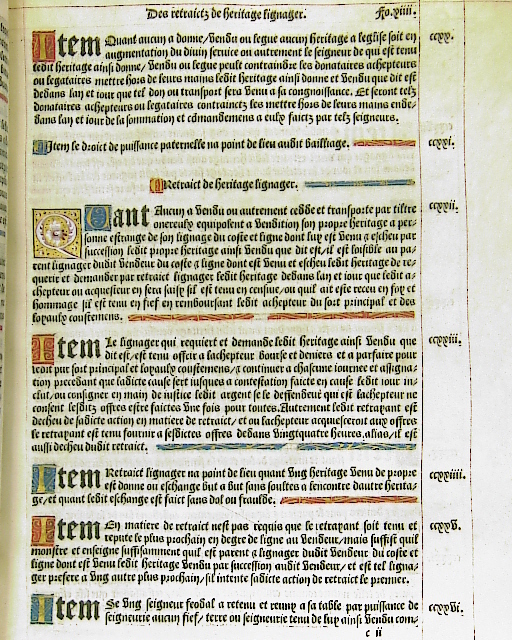 Customary law, a particular focus of the French Collection, figures prominently in the exhibit, with both manuscript and print exemplars, including the 1580 Coutume de Paris; this copy of the celebrated redacted coutume, a specially-produced version on vellum, was made for Mathieu Chartier, one of its five jurisconsulte-redactors, and bears his coat of arms. 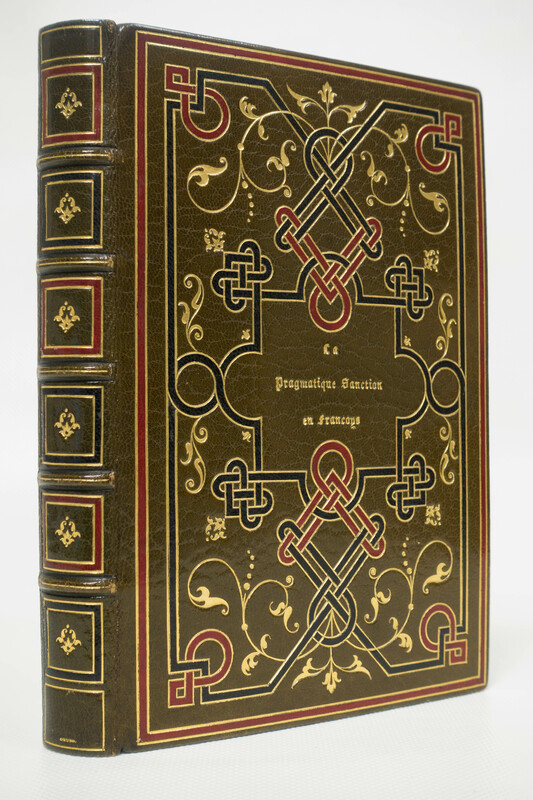 Written in the vernacular, La Pragmatique Sanction en francoys [Paris,1508] displays scholar/binder/bookseller Léon Gruel’s striking olive, red, and black leather binding. Gift of Richard and Diane Cummins. Le Coustumier dAniou et du Maine , from the celebrated reference library of the noted bookseller H.P. 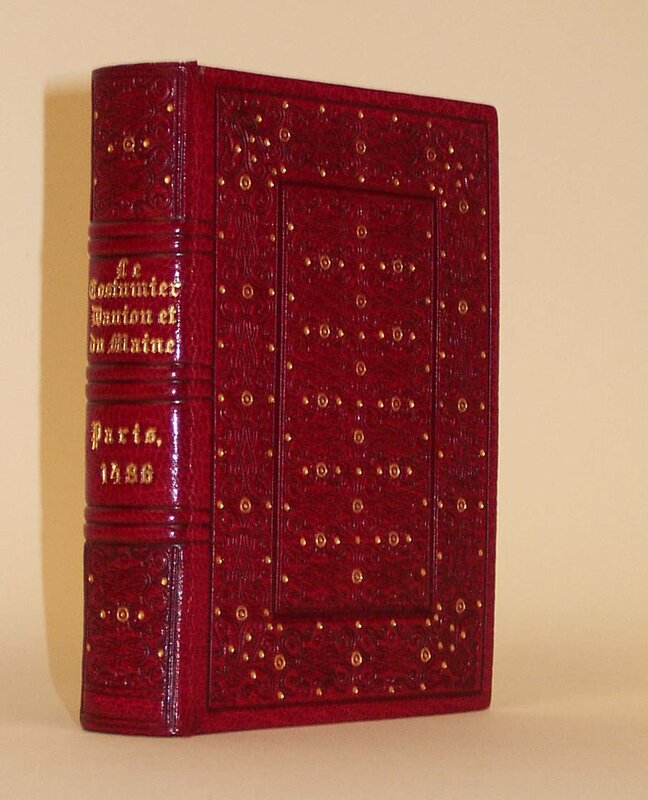 Kraus, wears a later jewel-like red morocco binding and exhibits marbled endleaves and gilt edges all around. The text of the diminutive Le Coustumier dAniou et du Maine features delicate rubricated initials and paragraph marks, occasionally in blue. 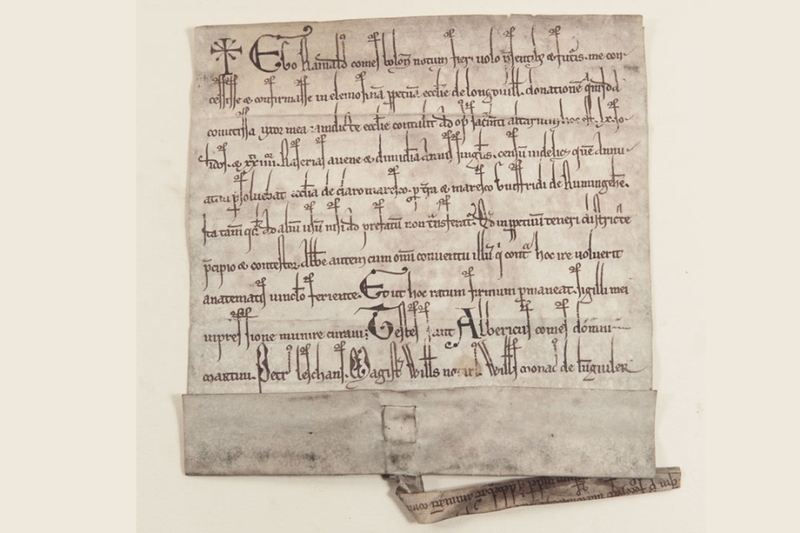 To the Abbaye de Clairmarais, a 1199 manuscript deed on parchment memorializes a grant of two farms by Hugo IV, Count of St. Pol, a prominent participant in the Third and Fourth Crusades. 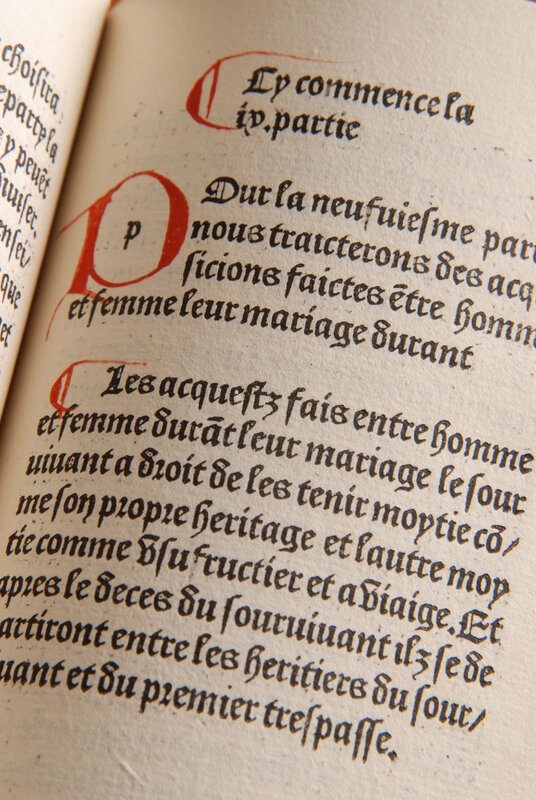 Printed on vellum in gothic type, Les Coustumes de Senlis  is a scarce work known in only two copies in U.S. libraries. This copy was owned by the Revolutionary-era jurist and bibliophile Pierre Théodore Noël de Payrat, and bears his book label. The exhibit is located on the first floor of the Law Library, in the display cases next to Circulation. The exhibit will run through August, 2018. [Manuscript]. Coustumes de Bretagne. Rennes? between 1456 and 1460. Le Coustumier dAniou et du Maine. Paris, 1486. Les Coustumes des duchez, contez & chastellenies du bailliage de Senlis. Paris, . Coustumes de la prevosté et vicomté de Paris. Paris, 1580. [Manuscript] Relating to the Abbaye of Clairmarais, a deed of two farms . [Manuscript] A charter concerning application of feudal laws to a property . Code Civil des Français. Paris, 1804. [Manuscript]. Partage de la succession de René Hatte, fermier general. [S.l., 1762?]. La Pragmatique Sanction en francoys. [Paris, 1508]. Assassinat de Mme. la duchesse de Praslin. Paris, 1847.